This spawn is a bit of an experiment. Both the Sire and Dame were purchased from my local aquarium store and caught my interest because of their size. 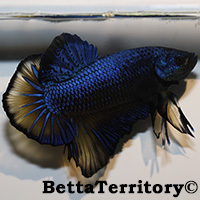 The Sire is a very large blue/yellow HMPK with a bodysize of about 5.5 cm with a promising form. 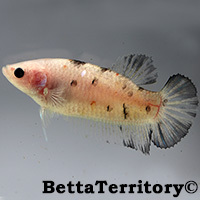 The Dame is koi/marble HMPK with a bodysize of about 4.5 cm. With this cross I would like to see whether the fry will turn out bigger than any of my other spawns with regular sized parents (4-4.5 cm). As nothing is known about the background of these fish the outcome will be a surprise. 12/01/19: The fry hatched. Looks like a nice amount of fry! 17/01/19: The Sire is taking excellent care of the fry in the nest. 06/03/19: The fry are now 8 weeks and have been moved to a bigger grow-out tank in order to stimulate their development.